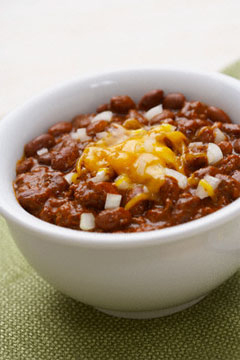 Chilly weather calls for a hot bowl of hearty chili! I like to serve this with warm corn tortillas. Heat the oil in a Medium sized pot. Add the chopped onion.Stir constantly for a minute or two. Add the garlic and stir for 30 seconds. Mix in the tomato paste, oregano, cayenne and a bottle of beer. Pour the beans and stewed tomatoes plus the liquids from the can over the garlic and onion. Stir a little and let simmer for about 5 minutes. In a separate pan, brown the turkey. Add to the pot and stir. Run through the blender or food processor if you prefer a smoother chili.